A 24/7 personal assistant for busy people. Offload annoying tasks to Magic to save time. I need you to call British Airways and request a credit on my account as they bumped my business class seat on my returning flight. Got it. I'll call British Airways regarding your return flight BAW1318. I will update you at 2pm. I left my credit card at a bar. Can you pick it up for me and bring it to my hotel? I'm locked out of my home. Send someone ASAP to help. And anything else, as long as it's legal and possible! 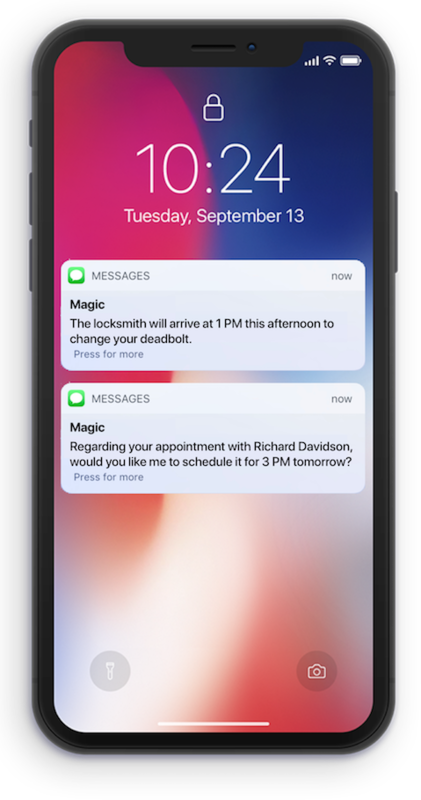 When you text Magic, you'll instantly communicate with a team of on demand personal assistants. Magic works 24/7. Magic's team of assistants are college grads and full-time employees with benefits. You can send anything to Magic. There's no limit. We use software to keep track of multiple requests at the same time. Magic is like having Elon Musk as your secretary. Magic is truly magic. 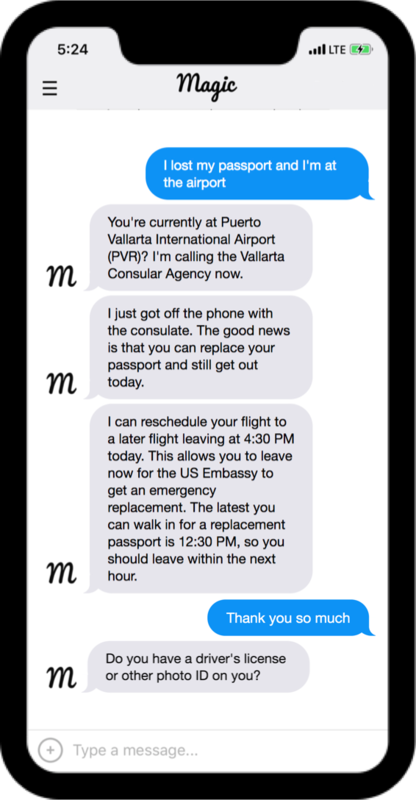 It's like having the Four Seasons concierge and an Ivy League intern at your fingertips 24/7/365. Magic is all the on-demand services rolled into one. I've asked them to help me with everything from booking a next day DMV appointment, to getting last minute tickets to exclusive events. Start chatting with an assistant right now. No cost to sign up. Cancel anytime. Delegate work to us with Magic for Business. When texting 83489, reply HELP for help and STOP to cancel. Msg & data rates may apply.